There are plenty of ways to keep current with what’s happening at the Ford School. Connect with us on social media to join Ford School public events, reconnect with old classmates, network with fellow policy professionals, and share your own good news. Facebook : Become a fan: follow the latest news and events, view photos from past alumni events, and connect with others. Flickr : Explore and download photos from dozens of Ford School events on our Flickr page--events feature students, faculty, alumni, and visiting speakers. Pinterest : View our boards with photos from school and alumni events; repin your favorite Ford School pics. Instagram : Enjoy Ford School photos and video. Google Plus: Add us to your circle to keep up on the latest news, learn about upcoming events, and see recent photos and videos. Video library: Visit our video library for public lectures, promotional videos, faculty research segments, and more. Youtube: The Ford School’s YouTube channel allows viewers to save, bookmark, like, and subscribe to most of the school’s videos. 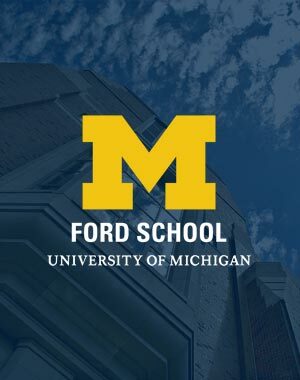 iTunes podcasts: Listen to audio files from Ford School lectures. Find our channel in the iTunes store.